Flemington NJs most exciting night out! The Paint Party Studio is an upbeat, creative class for everyone. A truly fun way to spend an evening for adults and a whimsical friendly studio for kids! Our talented teachers will guide you step by step in painting, through a 2-hour class. Your inner artist is just waiting to come out! Its a guaranteed relaxing fun night out! We provide everything you need: canvas, paint, brushes, aprons, easels, music and inspiration…. Just bring yourself, your friends, wine if you like and snacks and let the Paint Party begin! Never painted before? Then this class is for you! 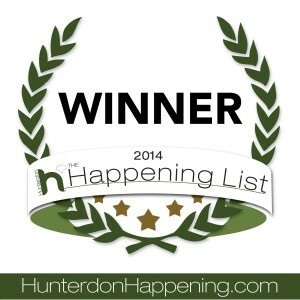 Hammer & Stain Central Jersey is excited to be located inside The Paint Party Studio! Create beautiful wood pieces! Join us for our DIY Hammer & Stain classes and let's start hammering and staining! In each workshop we will teach you how to distress, stain, and paint your very own project. When you're done walk out with your project and say #nailedit. They make great gifts! Please note We will close the classes out 1 day prior to prep so don't delay! The Paint Party Studio knows how to throw a party! Looking for a different way to celebrate a special event or get together with friends? 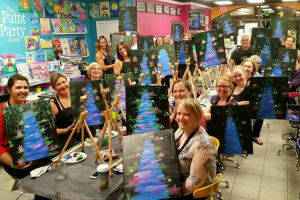 The Paint Party Studio offers Private Parties, Children's Birthday Parties, Off-Site Mobile Parties, and Corporate Events. Find out what sets The Paint Party Studio apart from the rest! It's our numerous Special Classes, of course! 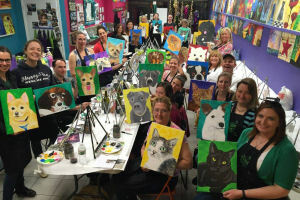 We don't just offer Canvas Painting Classes - The Paint Party Studio offers Paint Your Pet Classes, Paint On Wine Glass Classes, Silk Scarf Painting Classes, and Boart Art Classes.